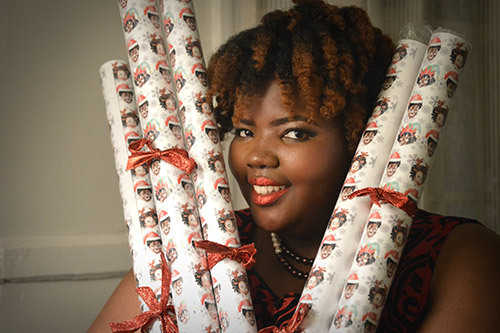 Samford 2011 graphic design major Kristin Farmer is celebrating the holidays with wrapping paper featuring her watercolors of African-American women with natural hair. The limited-edition product is available through her website curlycontessa.store. The Curly Contessa brand, which stands for matriarch of curly tresses, developed as part of her design business Flair Koncepts. Farmer works as an art director at the University of Alabama Birmingham (UAB) as well as pursues her design business and hopes to roll out additional products this spring including a line of birthday paper. She notes that there was nothing like this on the market and that she has received positive feedback with the initial offering. According to Farmer, “My advertising/marketing class and senior portfolio project at Samford provided tools to develop a business plan that included scope of work, a website, marketing, and product research.” Part of her plan was to raise capital through a crowdsourcing page and then the actual sale works as a donation in order to support the business. From concept to production, she has managed it all in less than 3 months. She challenges Samford students to learn from and understand different backgrounds and cultures. “If you don't, you really do not learn anything,” says Farmer. Farmer also believes in making sacrifices to find a vocation that is meaningful. As she says, her wrapping paper is more than gift wrap, “it is art,” and she plans to continue to share her talent and message with others.